Today, to celebrate these winter days, I propose you a GLSL-based post processing filter that looks like viewing through an ice-frosted glass. I found two implementations of a frosted glass effect and both have been tested and converted to GeeXLab. More shaders are available in the Shader Library. These demos require GeeXLab 0.2.9 and are not based on Python so you can use the version of GeeXLab without Python. Unzip the source code somewhere, start GeeXLab and drop the file DEMO.xml in GeeXLab. The 3D model used in both demos has been created with the Qoob modeller. 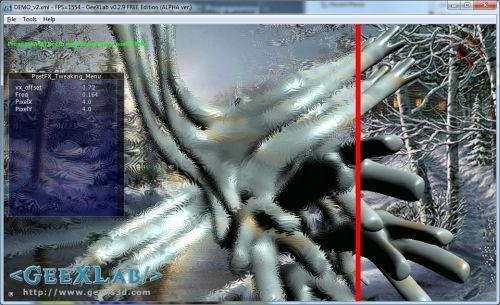 GeeXLab since version 0.2.7 supports the loading of Qoob meshes. More information about Qoob can be found here. 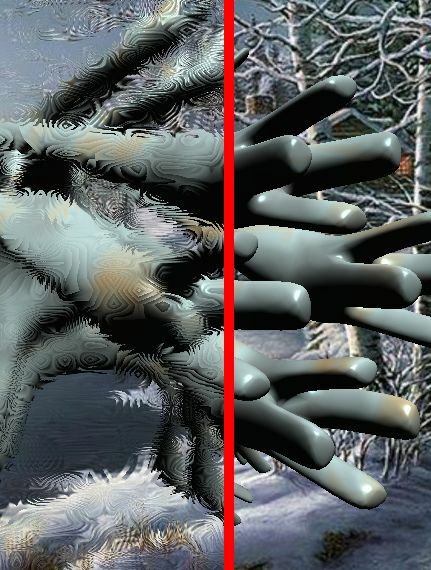 This frosted glass shader is a modified version for GeeXLab of NVIDIA’s ice-frosted glass HLSL shader. Second GLSL shader: next page please!